Martin Petrovaj added article E-shop in ASP.NET Core MVC - Using the Accounting Settings. We'll adjust prices in the product list according to the current VAT in the ASP.NET Core MVC e-shop. We'll create new helpers to display the correct price. Martin Petrovaj added article E-shop in ASP.NET Core MVC - Accounting Settings. In this tutorial, we'll introduce accounting settings to the e-shop in ASP.NET Core MVC, prepare the data layer, business layer, viewmodel, and controller. Martin Petrovaj added article E-shop in ASP.NET Core MVC - Persons - Finishing up. We'll finish the registration in our e-shop, processing the registration data using AutoMapper. We'll add a registration data editor for existing users. Martin Petrovaj added article E-shop in ASP.NET Core MVC - Persons - Views. Martin Petrovaj added article E-shop in ASP.NET Core MVC - Persons - ViewModels. 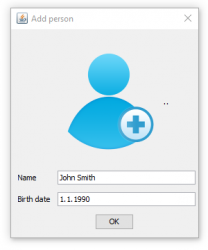 In this ASP.NET Core tutorial, we'll add viewmodels for person editing forms. The viewmodels will have advanced annotations, including our custom ones. David Capka added article First object-oriented app in Python - Hello object world. In this tutorial we'll create our first object-oriented app in Python - Hello object world. We'll create classes, attributes, and parametrized methods. David Capka added article Introduction to object-oriented programming in Python. The Python tutorial introduces to the object-oriented programming, explains its historical origins as well as terms as classes, attributes, and methods. Petr Štechmüller added article Dictionaries (maps) and sets in Java. In this Java tutorial, we'll introduce dictionaries and sets, describe the HashMap and HashSet classes and try these new collections on examples. James Max Max has registered. David Capka added article Birthday Reminder in Java Swing - Logic Layer. In this tutorial, we'll program the base of the logic layer of the birthday reminder app in Java Swing, create a Date class and use DefaultListModel. Petr Štechmüller added article Linked Lists in Java. In this tutorial, we'll explain the data structure of the linked list and introduce the LinkedList class, which represents this collection in Java. Petr Štechmüller added article Lists with arrays in Java. In this tutorial, we'll introduce lists and show detailed manipulation with the first list type in Java, represented by the ArrayList class. Petr Štechmüller added article Java Collections Framework. In this tutorial, we'll learn the basic part of the Java Collections Framework, visualize dependencies between classes and describe important interfaces. David Capka added article Introduction to collections and genericity in Java. In this tutorial, we'll introduce the Java collections, explain the term genericity and learn how to create our own generic class. David Capka added article Birthday Reminder in Java Swing - Form design. In this tutorial, we'll start programming a Java Swing window application reminding our friends' birthdays. We'll design a JFrame and JDialog. Dieter Achtelstetter has rated Introduction to the Java language. Dieter Achtelstetter has rated The flash-message mechanism. Jari Van Boven has registered. David Capka added article Simple calculator in Java Swing. In this Java tutorial, we'll program a simple form calculator using the Swing library. We'll learn how to work with components and display a MessageBox. Agostino I has rated Basic CSS selectors and properties. Agostino I has rated Polymorphism, final attributes and autoloader in PHP. Agostino I has rated Introduction to CSS (Cascading Style Sheets). Vikipedia added article Java Swing under the hood. In this tutorial, we'll explain how Java Swing works under the hood to understand what the Form Designer does for us. We'll learn to center the form. Agostino I has rated Inheritance in PHP. Agostino I has rated Exercises for OOP in PHP lessons 4-6. Hector David Urtiz has registered. Agostino I has rated Exercises for HTML and CSS lessons 4-5. Agostino I has rated Lists in HTML and a table example. Agostino I has rated UML - Class Diagram. Agostino I has rated Reference and primitive data types in PHP. Agostino I has rated Making an object-oriented component in PHP - Image Gallery.